Those of us from these areas have heard so many stories about truffles. Midnight walkers, covered with dirt and badly dressed, wandering in darkness accompanied by their only faithful companion, the ‘tabui’ (piedmontese word for dog). A silent search, hidden, treasure hunt where luck is convenient but what helps the most are the years of experience, the lessons handed down from generation to generation and much, much knowledge of the territory. And it is precisely those same men, the trifulau, who a few hours later with eyes swollen by insomnia struggle against time to sell the rough diamonds of the earth. The area of Alba, but more generally the woods of Piedmont, are known for the white truffle in particular, renowned and expensive, and also for the precious black, called Norcia truffle. These are the favourites of most, but there are many other edible varieties, diversified according to seasonality, habitat and size. And so there’s an entire harvest calendar, with the Uncinato truffle in autumn, the Bianchetto in winter and the delicate black summer truffle in the months from May to September. In this sizzling period in which the night attracts even the most unlikely nighthawks, one can often meet the trifulau parked with their four-wheel Pandas on the roadsides. And probably many people have asked themselves, what is it that they collect in the middle of summer? 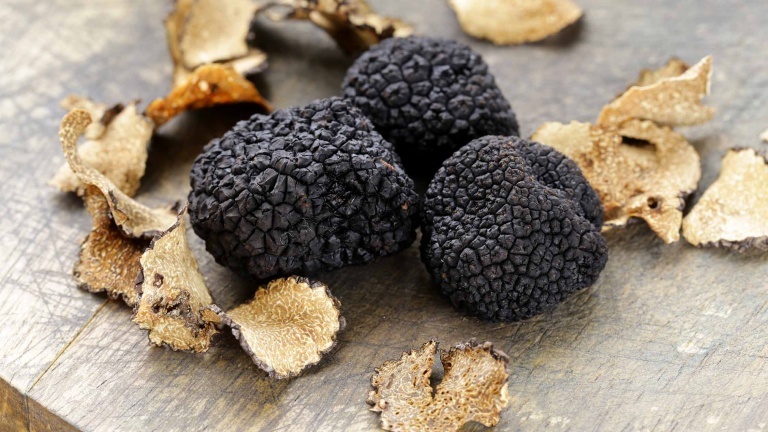 Because although this variety of truffles is widely available in our hills, and despite the excellent price/quality ratio if compared to the most valued ones, few know the Scorzone, also called for obvious reasons black summer truffle. The name, which comes with a derogatory connotation, is linked to the reddish peridium (rind) which is covered with pyramidal warts, making it more difficult to clean than other varieties. However, this truffle is resistant to factors that are usually crucial for black and white ones: drought does not challenge it, it bears any type of soil and it gives its best when cooked, which makes it the most suitable for many dishes. Obviously the time of year in which it grows doesn’t leave much room for doubt, but there are various evident criteria for telling a Scorzone from any other variety. The surface (peridium) when fully mature has a dark reddish color tending towards black, and is similar to the skin of an alligator, composed of small protrusions with the shape of diamonds. The flesh (gleba) has a color that varies from hazelnut to pale gray, with a very branched whitish marbling that doesn’t change color when exposed to oxygen, unlike other varieties. It grows in extremely varied types of soil, whether sandy and crumbly or clayey and compact, and grows in symbiosis with a large number of plant species, but in particular with oaks and hornbeams. It has a more delicate flavour than the winter ones. No one forbids shaving it fresh as a finishing element on dishes, but given its excellent resistance to cooking, it is more suited for sauces. The volatile compounds that give life to the characteristic scent bond with fats, so it is often also associated with rich foods like meat, cheese and eggs. Its rich woody aroma, reminiscent of garlic, wild mushrooms and hazelnuts, goes very well with lobster, caviar, foie gras, shallots, citrus and aromatic herbs such as tarragon, basil and rocket (rucula). It can retain its properties for up to a week if properly stored: dry, wrapped in paper towels or white rice and conserved in the fridge. 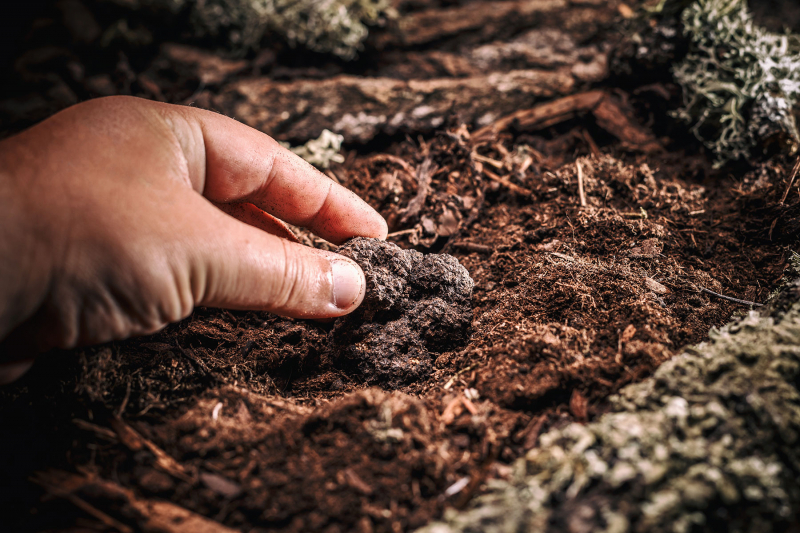 Because of the rough and warty surface, cleaning the black summer truffle is not easy, but given the lower value you can take some more freedom to speed up the process. First of all, use a soft bristle brush (or a toothbrush) and a rounded-tipped knife. The truffle should be gently rubbed to remove the earth residues, using the knife and trying as much as possible not to ruin the surface. In exceptional cases you can use a thread of cold water, possibly on a soft cloth to avoid putting the truffle in direct contact with the flow. Did we catch your attention? Buy fresh black summer truffle directly from the trifulau, and receive it at your house in a few days!